Vaping with a bulky mod can get in the way of the experience, but fortunately, you don't have to settle for a heavy, awkward mod to chase incredible clouds. The SMOK Mag 225W TC Starter Kit with TFV12 Prince Tank provides all the power you need with a highly ergonomic design. 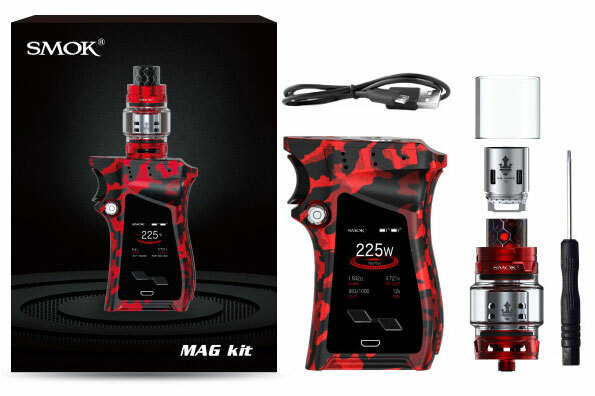 With the kit, you'll receive the SMOK Mag 225W TC Box Mod, the SMOK TFV12 Prince Tank, two coils, a replacement glass tube, spare parts and a USB cable. The SMOK Mag 225W TC Box Mod is designed to be as easy to fire as a pistol and features a curvy, streamlined body that fits perfectly in your hand. Its oversize fire key works like a trigger, making it easy to operate this vape wherever you go. For added fun, the flower-shaped battery button produces a clicking sound like the magazine of a firearm being slipped into place. You're sure to be blown away by the performance of the SMOK Mag 225W TC Box Mod. In Watt Mode, the box mod is capable of power outputs of up to 225 watts, opening the doors to tremendously large clouds. 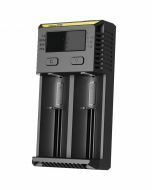 Use Memory Mode and you can store more than 20 of your power settings and be ready to use your vape in seconds. Prefer to savor the flavor of your vapor? The SMOK Mag 225W TC Box Mod can perfectly meet your needs. Its Temperature Control Mode gives you the flexibility to vape at temperatures of 200 to 600 degrees Fahrenheit. 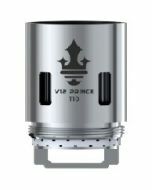 The vape supports Titanium, Nickel and Stainless Steel coils for even more flexibility. Intelligent Atomizer Recognition allows the box mod to recognize what you have loaded and to tailor performance to ensure a safe, satisfying experience. With the SMOK Mag 225W TC Box Mod, you're in full control of your vaping experience. The large OLED screen shows off a high-definition user interface that allows you to easily monitor and set your vape. You can easily see the mode, the vaping effect, the voltage setting, the resistance value and other key pieces of data, and the screen can be set to six different colors for easy viewing. 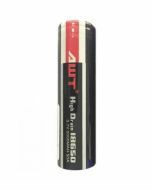 Dual battery-life indicators allow you to keep tabs on the performance of your 18650 cells. You can say goodbye to frequent battery replacements with the SMOK Mag 225W TC Box Mod. The box mod supports on-board charging, so you can recharge without removing the batteries from their easy-to-access compartment. With the included USB cable, you can also update the firmware on your box mod to continue to benefit from the latest technologies SMOK has to offer. The SMOK TFV12 Prince Tank included with the SMOK Mag 225W TC Starter Kit showcases SMOK's impressive new Cobra drip tip. Stylishly designed, the drip tip shows off an appealing geometric pattern in a bold, color-pop finish. A locking top cap prevents leaks, so you'll never waste a drop of your juice. 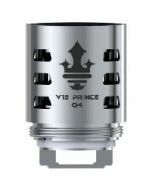 With the SMOK TFV12 Prince Tank, you can vape on and on without having to worry about refilling. 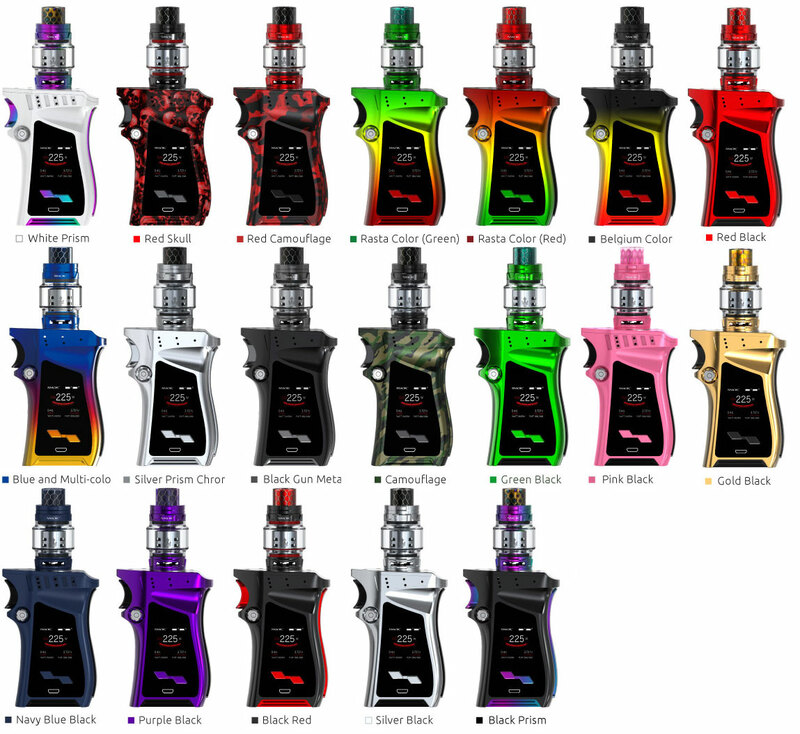 The tank has an extra large 8-milliliter capacity to hold plenty of juice. And when it does come time to replenish your liquid, the top slot makes it simple to do so. Load up the SMOK Mag 225W TC Starter Kit and you'll be ready to fire off huge clouds on demand. Order the kit now and discover the benefits of the ergonomic SMOK Mag 225W TC Box Mod and the advanced SMOK TFV12 Prince Tank. MAG uses flower-shaped button for battery installation, lock and load system, you can hear the sound that a real gun magazine being loaded.